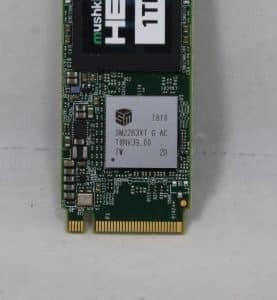 We had a chance to visit Mushkin at CES this year and they had a lot to show us on the storage front with a couple of new SSDs including the high-performance Pilot-E NVMe M.2 SSD, Source 2.5″ SSD, as well as the more budget oriented Helix-L M.2 drive (shown off at last year’s CES). 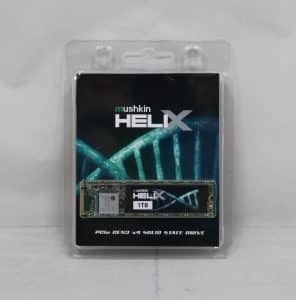 In leaving that meeting, Mushkin was kind enough to give us a sample of the Helix-L as well as some Ridgeback DDR4 RAM for review – the latter we will see soon as well. 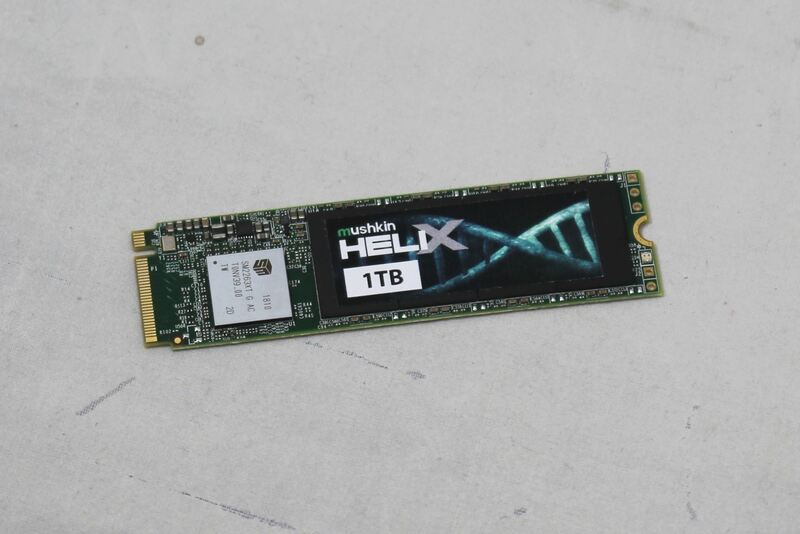 The Helix-L purports to be a budget offering with good performance (up to 1700/1500 MB/s R/W) and a solid value per GB. The Helix again uses a Silicon Motion controller and runs without a DRAM module (cost savings) using Host Memory Buffer (HMB) and system RAM similar to how drives with integrated DRAM work as well. We’ll put the drive through its paces and see how the DRAM-less drive performs! 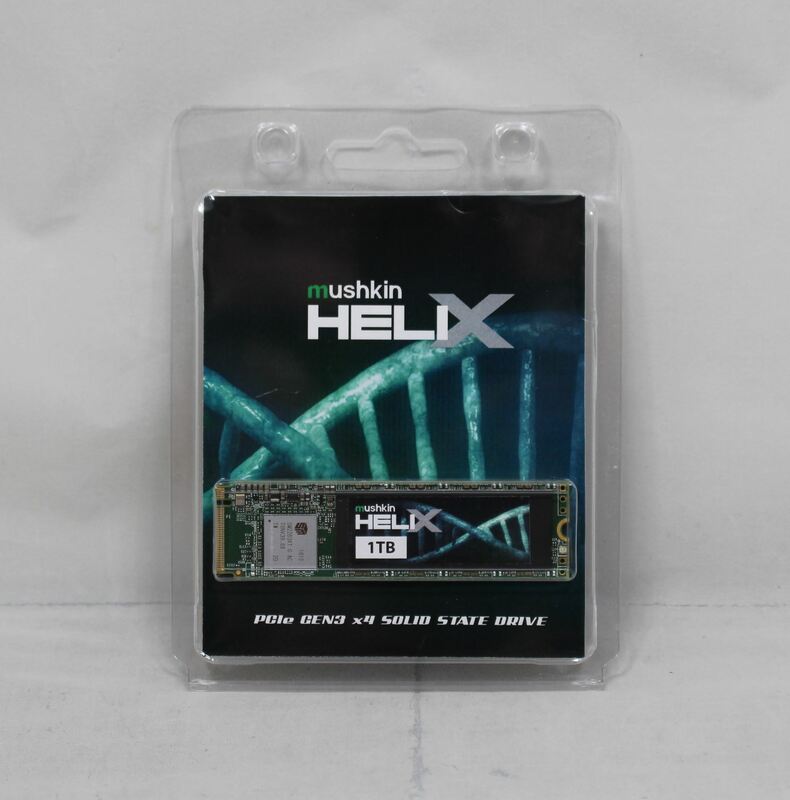 The Mushkin Helix-L drives are based on the Silicon Motion SM2263XT controller which uses the NVMe Host Memory Buffer feature. HMB technology uses system RAM to cache the translation table. Even though the SM2263XT is their budget controller it still uses four PCIe lanes with a dual-core ARM Cortex processor driving it. The controller supports full disk encryption with 256-bit AES using TCG Opak and IEEE-1667. Mushkin says encryption can be enabled without a performance reduction. 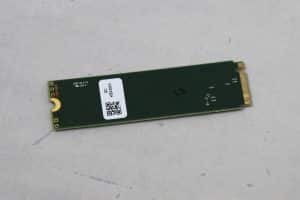 Silicon Motion uses NANDXtend ECC Technology (SMI proprietary) a low-density parity check code to make sure data is secure on the flash itself. This particular drive is said to reach speeds of 1700 MB/s reads and 1500 MB/s writes with IOPS peaking around 280K using HMB and 140K without. The 1 TB drive we have in hand is of the 80 mm variety and single sided. 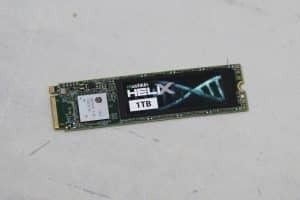 The Helix drives are not meant to be top of the line performers, but a way to get into the fast world of NVMe based drives at a more palatable price point. 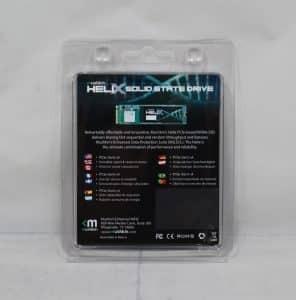 The packaging itself is a simple clamshell with the drive protruding from the front in its own space. There is a thin piece of cardboard for marketing describing the drive inside. The drive itself is 80 mm long with all of the functionality on the top part of the drive (hence the single-sided nomenclature). The grey IC there is the SMI SM2263XT controller while hidden away under the sticker is the 3D NAND. Mushkin does not have software specific to its drives. 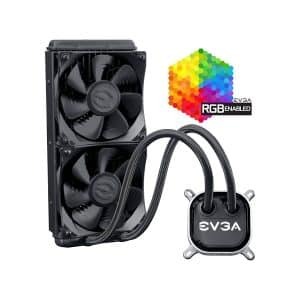 A special thanks go out to EVGA for providing the CLC 240 CPU Cooler and 750 W G3 Power Supply to cool and power the system, G.Skill for the Trident Z DRAM, and Toshiba OCZ for the 480 GB TR200 SSDs storage running the OS, benchmarks, and games. With our partners helping out, we are able to build matching test systems to mitigate any differences found between using different hardware. This allows for multiple reviewers in different locations to use the same test system and compare results between reviewers minimizing system variance. 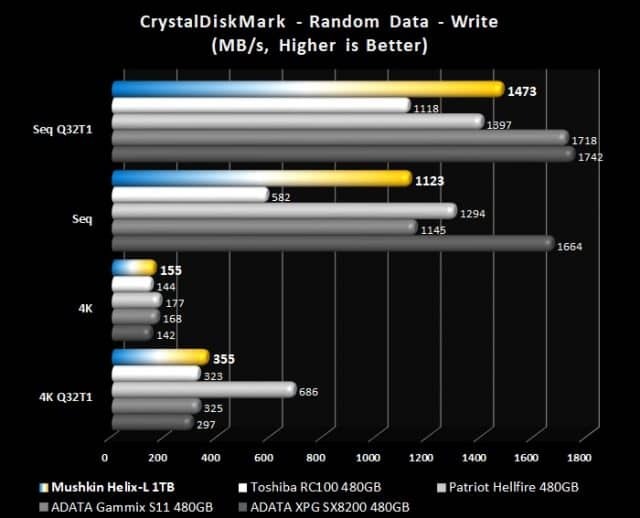 Performance in Crystal Disk Mark (CDM) was good when comparing it to like drives such as the Toshiba RC100 480 GB we reviewed a few months back. The other drives in the graphs, Patriot Hellfire and ADATA drives, are more expensive, intended to perform better, and generally, do. 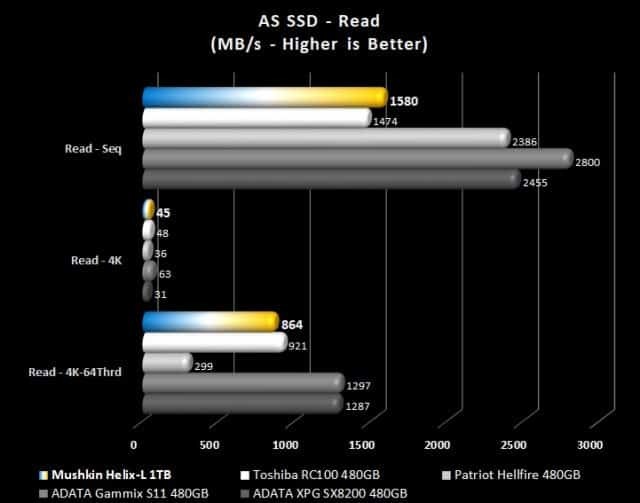 We can see for sequential reads the Helix-L is a bit quicker than the Toshiba drive and then trades blows with it for 4K and 4K Q32 queue depth reads. On the writing side, the Helix-L shines here eclipsing both the RC100 as well as the Patriot Hellfire sequential writes. For 4K write tests, the drive also has a good showing here and is right there with other faster rated and more expensive drives. Moving on to AS SSD read and writes we see a similar story that was painted above. 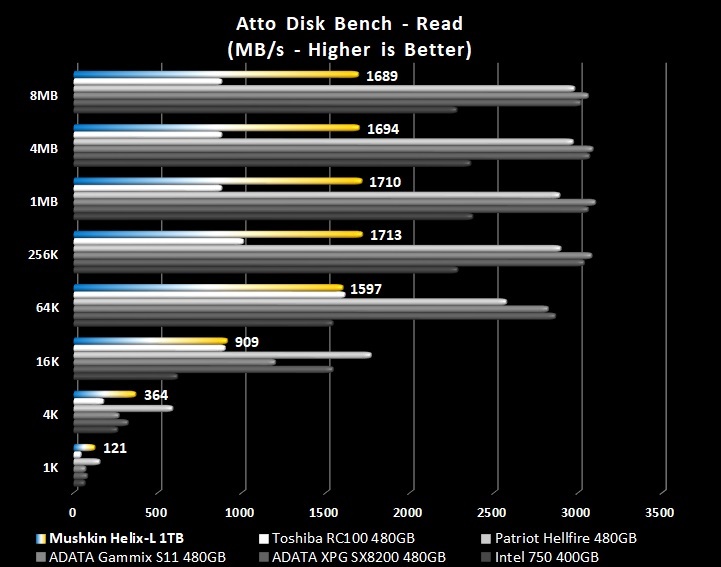 In sequential reads, the Helix-L barely beats out the RC100 reaching 1580 MB/s while 4K reads sit at 45 MB/s. This is slower than the RC100 but faster than the Hellfire and ADATA drive. 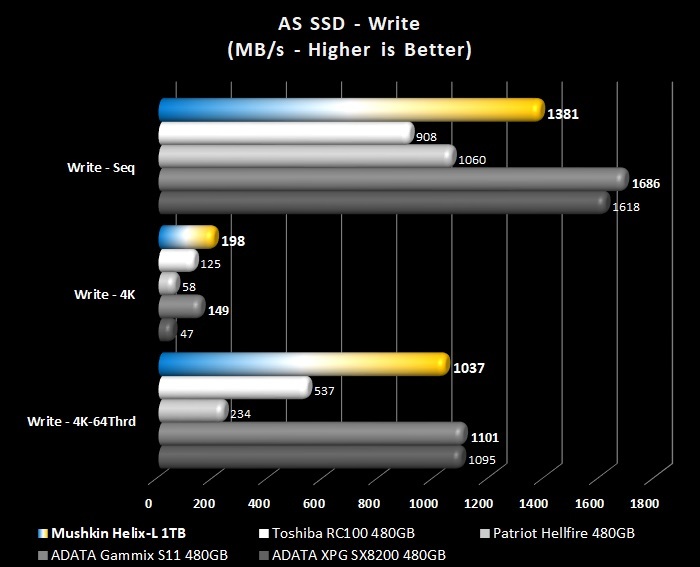 For writes, the Helix-L is faster than the RC100 and Hellfire in sequential. 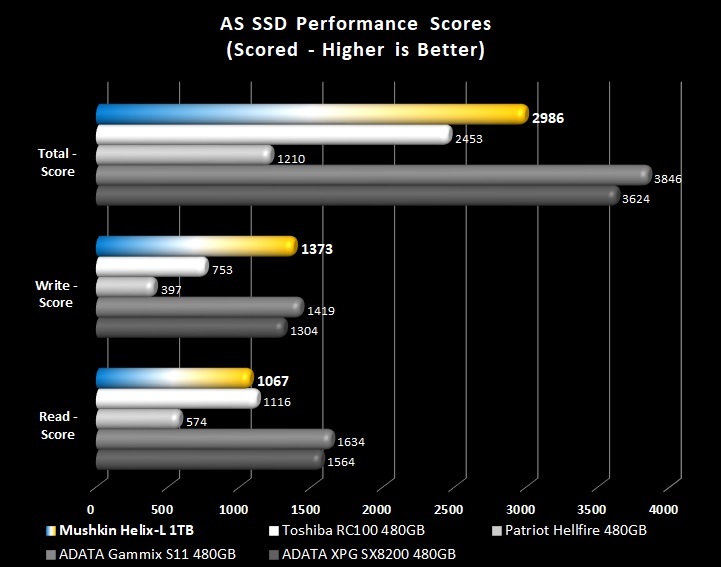 Both 4K results here were VERY good, either beating or coming darn close to the much faster drives. An impressive showing here in this benchmark. The access times on the Helix-L are where we want them to be. No worries here. 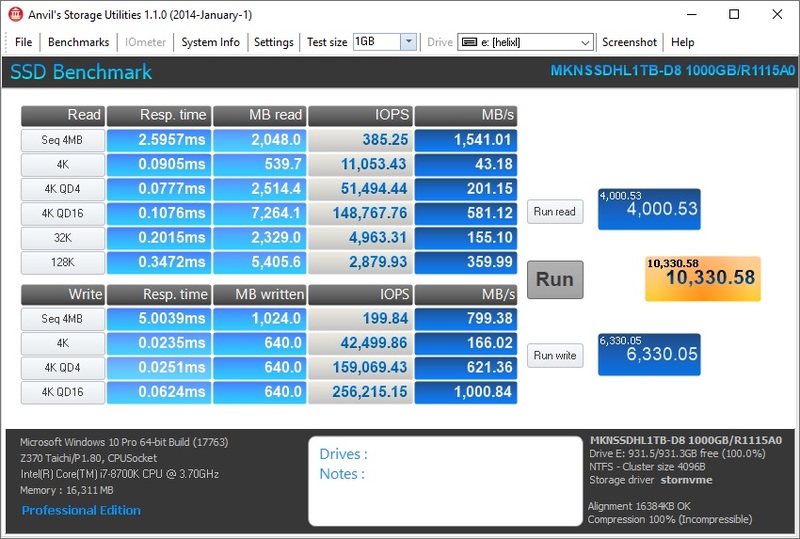 Overall, the drive scores 2986 beating the RC100 and surprisingly, the Hellfire which uses its own onboard DRAM. Our ATTO results show the drive meets or exceeds its specifications again performing better than the drive it more closely compares with by performance and price tier (RC100). In both 4K reads and writes, in this sequential best case scenario the drive ramps up faster at 4K files sizes faster than most drives in the lineup. For our Anvil results, we do not really compare and graph the results, but we can see here it scores 10.3K overall with read scores of 4K and writes 6.3K. This compares favorably to the RC100 that managed 8.3K overall with 4K reads and 4.6 writes. 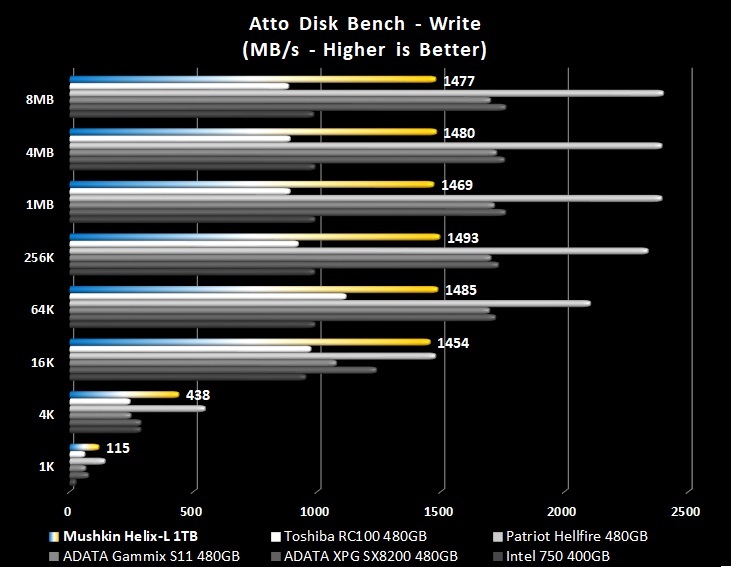 Clearly, on these tests, this drive does well on the writes side. For a DRAM-less drive, performance in typical workloads was good in our testing beating out the RC100 handily who also does not use a DRAM chip on board, but HMB. It seems where this technology could slow down is on extended writes/reads where the amount of data will be cycled in and out of system RAM. While system RAM is fast, it is not as fast as having the DRAM buffer on the M.2 module itself. The point of this is to save money and lower the overall cost per GB while still offering good performance. 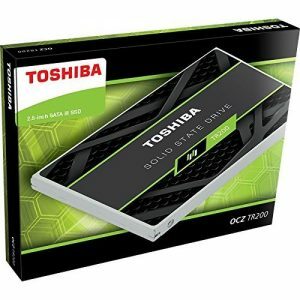 The RC100 for the 480 GB drive was priced at $150 a few months ago and currently, it can be had for $125-$160 at smaller shops (Newegg and Amazon are out of stock without pricing). 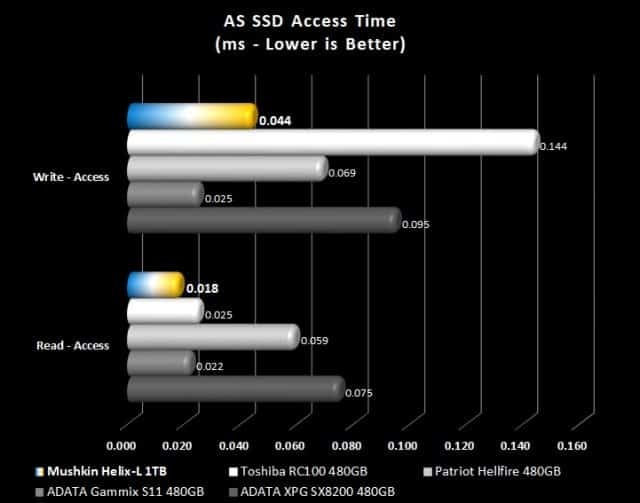 Compare this to the 480 GB ADATA Gammix S11 is currently $100 @ Amazon and is a notably faster drive on the read side. 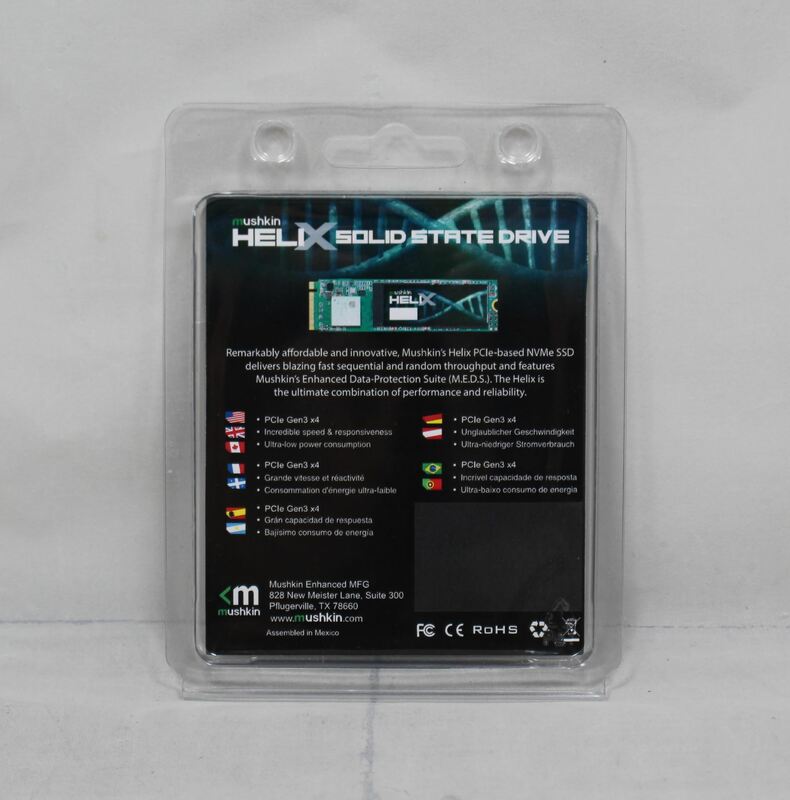 All this is fine and dandy, but we do not yet know the price of this drive. Because this drive purports to be a good dollar per GB value, it is difficult to make a recommendation without it. So long as it is in the ballpark of the RC100, it will be a good value. It is a saturated market with performance of M.2 modules all over the map. 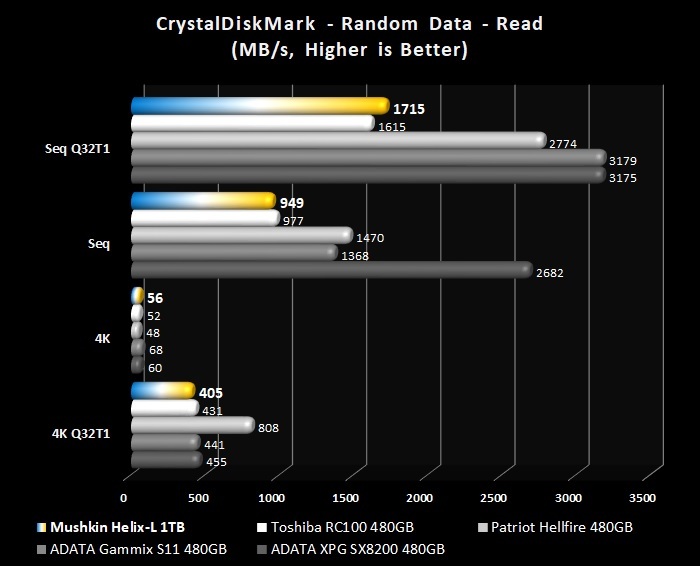 Compared to the Toshiba/OCZ RC100 the drive performed well beating it out in most tests. In some, it even beat out the (likely) more expensive performance minded Hellfires so performance is there. 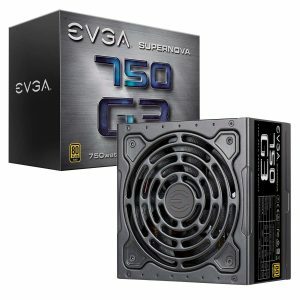 Let’s see where Mushkin decides to price out the drive before we give it the “Approved” stamp though. We should have pricing and other details added to the review shortly after it is published (waiting on Mushkin to get back with us).